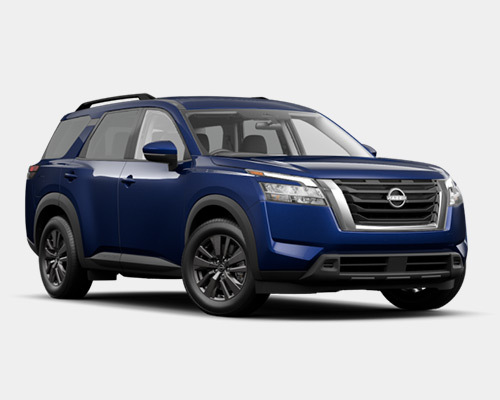 In the market for a mid-size sport utility vehicle (SUV) that seamlessly combines capability and comfort? In this case, the most suitable option for you to purchase or lease in Orlando is the latest Pathfinder found at Universal Nissan. We are sure after spending a short amount of time going through everything this incredible SUV has in store for you, walking through our showroom doors for up-close views from every angle moves to the top of your list. Everyone notices you are arriving in a Pathfinder due to its rugged design sporting curves lower on the body, a signature LED line in projector headlights, body-colored side mirrors with turn indicator, and trademark taillights. Deflectors and spoilers positioned strategically also add to creating an unmistakable appearance. Not blending in like other SUVs you come across on your travels becomes second nature when all sides show off unequaled attention to detail. 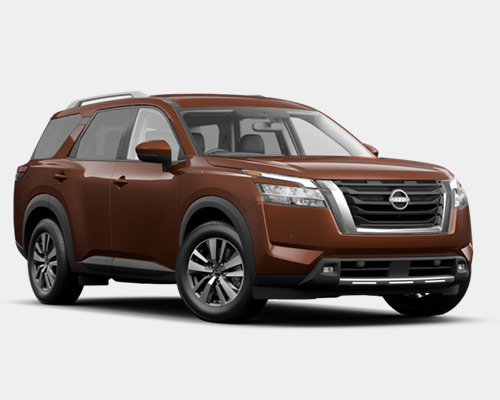 Having your family and friends join you on exciting escapades around or outside of Orlando FL is simple once you purchase or lease the brand-new Pathfinder from Universal Nissan. Using the EZ FLEX Seating System with LATCH AND GLIDE functionality, you can quickly tilt second-row seats forward to easily access the third row of seating and fit a total of seven passengers. Sliding over the middle chairs to open up five additional inches of leg room and reclining the last row of chairs also offers extra comfort. Pathfinder possesses the necessary strength, towing abilities, and off-road handling to plan out a wide range of excursions you have been longing to take. A 3.5-liter (L) Direct Injection Gasoline (DIG) V6 engine generating 284 horsepower (hp) and 259 pound-feet (lb.-ft.) of torque is capable of towing a maximum of 6,000 pounds (lbs. ), while available Intelligent 4x4 with 4WD lock mode supplies all-weather traction for steady steering on any pathways. This SUV’s range of power clearly prepares you for hectic city driving on a daily basis, cross-country journeys, and everything in between. As one of the starting Pathfinder models, SV contains plenty of inclusions to simplify how you tackle everyday drives throughout Orlando and discover unfamiliar paths to explore. These forms of convenience include Nissan Intelligent Key, Remote Engine Start System, auto-dimming rearview mirror, variable intermittent flat-blade windshield wipers adaptive to speed, and a Tri-Zone Automatic Temperature Control System. Taking the elements of SV to the next level, Pathfinder SL adds quite a few comfortable touches and stylish details. Thanks to the first two rows of seating and a steering wheel heated, 10-way power driver’s seat with two-way lumbar support, and Nissan Navigation System, SL keeps you cozy and headed in the right direction whenever you turn the ignition. Crafted with each of the components you need to rule the roadways wherever you journey, Pathfinder Platinum comes out on top in every category. This luxurious SUV without question elevates your regular commutes and weekend getaways, while holding the interest of others, owing to attributes ranging from a Dual Panel Panoramic Moonroof and leather, temperature-controlled front seating to the tow hitch receiver incorporating a seven-pin wiring harness and 20-inch (in.) aluminum-alloy wheels distinctively designed. Lack of storage space when loading up lots of cargo and having to leave things behind will no longer cause you much frustration. Using little effort, seats in the second and third rows of Nissan Pathfinder fold down to create a level storing area of 79.5 cubic-feet (cu.-ft.), and a swing of your foot under the rear bumper expedites putting stuff in by triggering the Motion Activated Liftgate. In addition, secure big items on the roof rails (optional crossbars), place valuables in the underfloor storage compartment, and push on the ignition button to head off on your excursion sooner than expected. Owners or lessees of the reinvented Pathfinder from Universal Nissan reap the benefits of having entertainment, voice-recognition communication functions, and important details right in front of them. Whether you need to call someone, look up movie times, check the weather forecast, or access certain apps, the NissanConnect eight-in. touch-screen monitor, Advanced Drive-Assist Display, SiriusXM Travel Link (free three-year trial), and Bluetooth keep you connected. The ride to your destination becomes equally enjoyable with such an abundance of accessible in-car technology. The perfect playlist not only sparks anticipation of an amazing adventure, but also jump-starts your excitement of going on awesome road trips. You are in charge of the songs played inside your Pathfinder through illuminated controls on the steering wheel, HD Radio, streaming audio, and SiriusXM Radio (first three months free). If you wish to amplify these musical sounds, opt for the Bose Premium Audio System comprised of Acoustic Waveguide engineering and 13 speakers. The overarching idea to bear in mind? 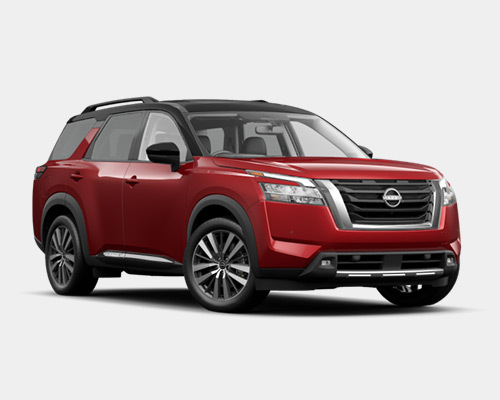 Dropping by Universal Nissan to purchase or lease the Nissan Pathfinder trim you prefer brings totally new opportunities for exhilarating excursions in Orlando and outside city limits due to off-road competencies, class-leading towing, and cabin adaptability.